A lot has happened since my last blog post. I turned one year older in the month of October, and I made a change in my writing career that I’m extremely excited about. 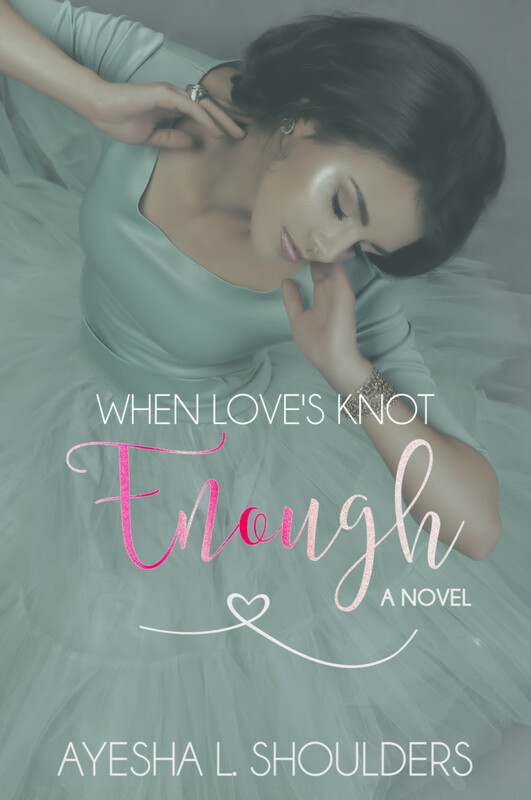 I even have a new cover for my latest book – When Love’s Knot Enough. Yes – change is good! This is why fall is one of my favorite seasons. The leaves start to change to an array of beautiful colors, and the weather starts to taper off to that midpoint in your closet where it’s not too cold for your UGG boots just yet, but definitely time to put up those open-back shoes. Some of you may have even noticed, while you were out shopping for fall decorations, that the stores immediately jumped to Christmas decorations before Halloween had ended. This has always baffled me. November is such a special month. Though we should give thanks all year, November has always been that symbolic month that people get together with family and friends to celebrate and give thanks over a wholesome dinner. Unfortunately, it’s also a time where many people fall into depression. Sometimes we get caught up in our valley experiences (trials in our lives) that we forget to be thankful for what we do have. Two years ago, I wrote my first short story that I’m about to share with you. It serves as a reminder that even when we’re going through a tough time in our lives, there’s always something we can be thankful for…whether it’s the memories that we shared with a loved one or our faith that keeps us hoping for something greater. I woke up in the middle of the night. For the third night in a row I was having difficulty sleeping. The alarm clock on my nightstand said 3:00 a.m. I looked over to the place where my husband used to sleep, and a surge of great sadness started to overtake my body. I began to cry; my vision became blurry as I was engulfed in a pool of my own tears. The hair along the sides of my face was now soaked and was matted to my pillowcase. I immediately sat up in bed and looked to the heavens. My soul began to cry out as I tried to figure out how I was going to get through this depressing time in my life. “How can I get through this without you, Jim? !” I yelled at the top of my lungs. I reached over and picked up his pillow and tossed it across the room. “You said you would never leave me! How dare you leave me like this? !” I yelled. It was days before Thanksgiving and instead of preparing a wholesome family dinner for two, to kick off my favorite time of the year, I had to prepare for a funeral. My husband of twenty-five years is now gone – taken from this world at a blink of an eye. Our only son is away in Afghanistan trying to get orders to come home. I have no family in the area. They all live on the west coast while I reside on the east coast, because Jim wanted us to move here. We did everything to make each other happy in our marriage. But my decision to move to the other side of the country has put me in a place to grieve the loss of my husband alone. I feel like I can’t go on without Jim. It’s as if someone cut my heart open, gouged out my eyes, and left me to wander around in this world in a state of despair! I can’t see tomorrow without eyes, and I definitely can’t live without a heart. What am I going to do? I thought as I got up to pick up Jim’s pillow and place it back beside me in bed. Jim’s gone and I’m now alone. Instead of lying on my wet pillow, I pressed my head against Jim’s. I could still smell his scent on the pillowcase. The times I took for granted that he would always be by my side have now left me remembering him through his scent, yearning to have one more day to yell at him for falling asleep with the television on. The thought made me smile. My smile turned to laughter as I thought about our last conversation in bed. He made a joke about my pajama pants because I had holes in the leg. I didn’t care. Jim always said I held onto things longer than I should. I simply swatted at him playfully and kissed both sides of his cheek – reminding him that he married me this way. He said he did and he wouldn’t change it for the world. As I released my hold to his pillow, I knew without a doubt that I was not alone. Jim was still here with me, although not physically. His pillow could still kiss both sides of my cheeks and lie with me in bed at night. I will always be thankful for the times we shared. I closed my eyes and fell asleep peacefully…with Jim and God by my side.